It’s summer time! Okay, I know I know, there’s no four seasons here in Singapore. There’s only the summer season here. However, every year, there will be certain parts of the year when it will be extremely scorchy and hot – like now! The weather is sunny, humid and windless (thanks to all the high-rise buildings in Singapore >.<), with only a little bit of rain intercepting this hot weather now and then. So to beat this heat, I made some Ice Lemon Tea. Is it Iced Lemon Tea? 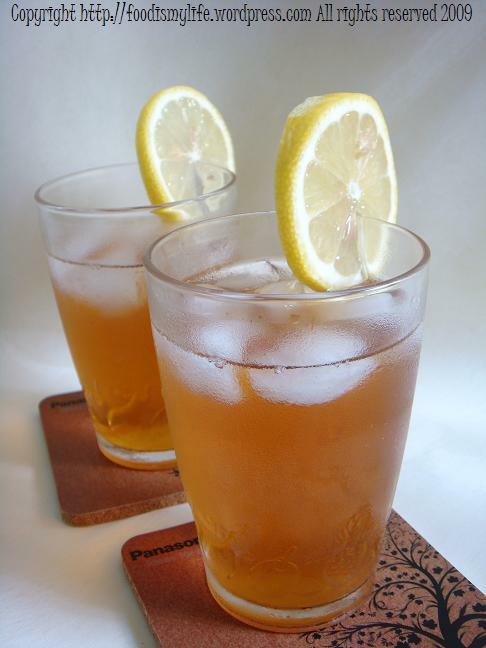 In Singapore it’s very easy to get some bottled and chilled ice lemon tea, but I find most of them a tad too sweet, and I prefer something that is more lemony, so making my own ice lemon tea is the best option. Moreover, it is so easy to make them. After you know how it’s made, you will know how much money those beverage companies are earning from us. Seriously, all of these ingredients are easily accessible and inexpensive. First, bring the water to boil. After the water has boiled, remove the pot from the heat and steep the 2 tea bags in for at least an hour (up to 2 hours). Well I know some of you would like to play cheat and use more tea bags and cut back the timing, I’m not sure how it will affect the overall taste, but I would still like to play safe – and I encourage you to play safe too! Drain the tea bags and remove. Stir in the sugar and lemon juice. Add more sugar or lemon juice to suit your liking. Let the drink cool to room temperature before refrigerating until well chilled (at least 4 hours). Serve in anyway you like!